Hundreds of thousands more babies could be born outside hospital each year under new NHS guidelines for England and Wales. The National Institute for Health and Care Excellence (NICE) said home births and midwife-led centres were better for mothers and often as safe for babies. The advisory body said it was important to offer women the options. The Royal College of Midwives said more midwife-led units were needed to offer all mothers-to-be this range of choice. 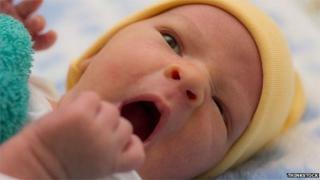 About 700,000 babies are born each year in England and Wales, nine out of 10 in doctor-led obstetric units in hospital. However, the new guidelines state 45% of women are at extremely low risk of complications and may be better off giving birth elsewhere. NICE specifically advises England and Wales, but its recommendations are often picked up by Scotland and Northern Ireland. It said women should be offered the choice of a home birth, an obstetric unit in hospital, a midwifery unit next to a hospital or a midwifery unit in the community. In all circumstances there should be one midwife per woman in labour, it added. For those having their first child, the number giving birth with no medical interventions was higher for home births and in midwife-led units than in hospital. But there was a higher risk of serious medical problems for the baby, including stillbirth, for home births. In women who already had at least one child, again there were fewer medical interventions outside hospital. It is not entirely clear why there are high rates of interventions in hospital. It is thought to be a combination of women being more comfortable in a familiar environment and with midwives they have met before. There is also concern some doctors might be too keen to use clinical interventions. Susan Bewley, professor of complex obstetrics at King's College London and part of the team that developed the guidelines, said: "Midwifery-led settings have better outcomes for mothers than the traditional obstetric units and labour wards. "They may be particularly suitable for all women because the rates of intervention are lower." However, she stressed the emphasis was on choice. "There isn't a one-size-fits-all model for all women and that's why a range of settings providing different support for women with different needs gives you better safety overall," she added. Cathy Warwick, chief executive of the Royal College of Midwives, told the BBC News website that she welcomed the guidelines - as do the Royal College of Obstetricians and Gynaecologists. She said: "The evidence shows that if women don't have any complications in their pregnancies they'll have better outcomes if they are able to make these choices." She said there would have to be significant changes in the way the NHS provided maternity care. There are about 80 midwife-led units based on hospital sites and a further 60 located elsewhere. "What the NHS needs to do is provide the facilities outside of hospitals that will allow about 45% of women expecting babies to plan their birth in different facilities," she added. "We need more midwifery-led units, then we may find that we don't need so many obstetric units." But Lucy Jolin of the Birth Trauma Association told BBC Radio 4's Today programme it was not always safe for women to give birth outside hospital. She said: "Things can go wrong very easily and we do feel this advice could be dangerous."